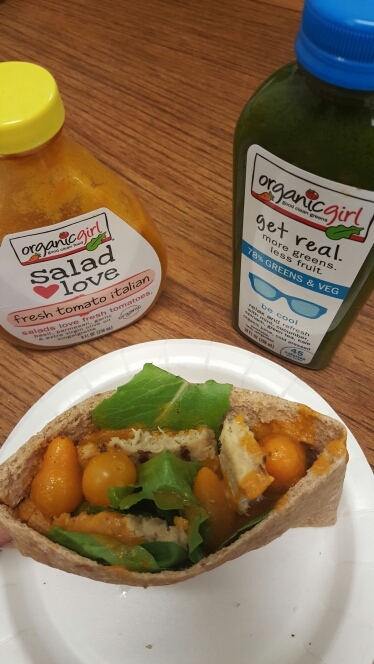 Get Green with new OrganicGirl foods! We’ve known about our namesake almost twinsie, Organicgirl greens, for over a year now. Their organic pre-rinsed greens mixes have taken center stage in our fridge for months. Their spinach has starred in our green smoothies, their arugula pizzazzed our pizzas. And yet, we were surprised to find out they had ventured into 2 new product markets, green juices and salad dressings. Could they get any greener!? 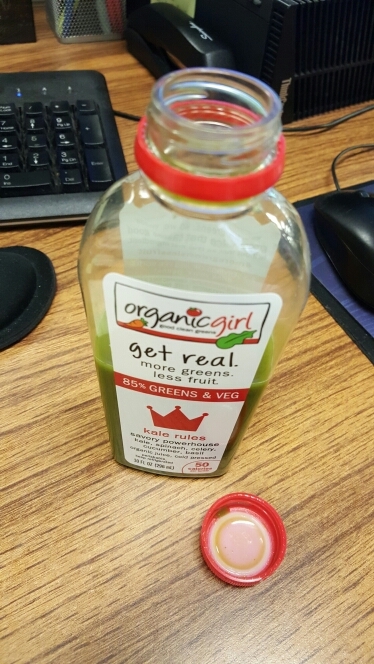 As big Organicgirl fans, we got to sample both the dressings and juices at the recent Fit Foodie Run and (BONUS) were treated by Organicgirl to our very own bottles for further taste inspection. We’ve been wondering, we have all these BPA free recycled clam shells of Organicgirl spring mix, what do we dress it with!? Lemon Agave, White Cheddar, Fresh Tomato Italian or Kale Parmesan. Can we put a squeeze of each on single leaves? 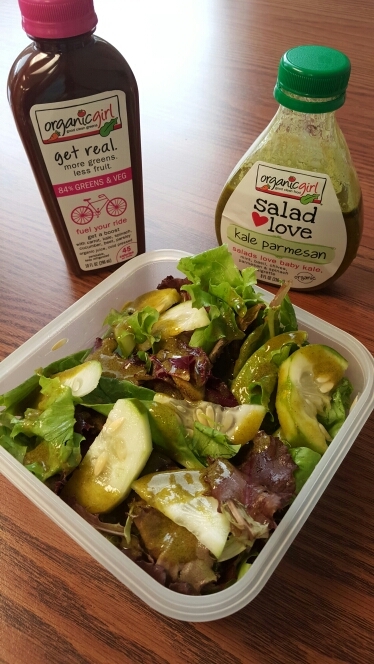 Each dressing has it’s only unique flavor profile that fits particularly well with the various greens that Organicgirl offers. The Zesty Tomato Italian mingles with pepper greens, feta, artichokes, olives and roasted garlic. For a fast and easy lunch, take a Toufyan multigrain pocket filled with greens, organic yellow cherry tomatoes, Morningstar Farms grilled chicken and dressing. The Kale Parmesan, reminiscent of pesto, meshes with super greens, quiona, baked butternut squash, red and green bell peppers, and pumpkin seeds. Continue fall trends with White Cheddar dressing drizzled over a spinach, green apple, dried cranberry salad with walnuts or hold on to summer with Lemon Agave dressing, watermelon, pinches of cayenne, jalapeno and that baby spring mix we mentioned. Another quick lunch creation to add with raw organic greens include cucumbers, veg grilled chicken and shaved Parmesan. Also, check out this super cool blog, Nutrition Happens, for even more recipe ideas. Let’s get drizzical, drizzlical (Olivia Newton John reference!) with these new drizzly dressins’. Fair Warning: If you are the type who loves your juice super fruity fruit loop flavored, these may seem a little..umm..veggie heavy (aka healthy tasting). However, fear not. Organicgirl tells you these organic cold pressed vegan juices are “More Greens, Less Fruit” so you can’t act like you didn’t know. They are way lower in calories (think 45-60 for a full bottle) and way way lower in sugar so you won’t feel like you are crashing after drinking them. Additional goodness: They have 2-3 servings of veggies in each bottle so it’s an easy way to down a head o’ lettuce or two to start your day or supplement your lunch. 4 veg-rrific options await you: The light and lemony “Brighten Up”, The minty cucumber “Be Cool”, The King of All Greens and ruler of the iron throne (hehehehe) Kale Rules and…. Our vote for best Organicgirl juice: “Fuel Your Ride” with 84% Greens and Veg, pumped up with kale, carrot, spinach, cucumber, beet and parsley. We suspect the beet and carrot create a magical spell to make the kale less bitter. Don’t be green with envy (HA!) other juices. You can find Organicgirl products at Mariano’s (unless it’s Sunday when everyone snags all the baby spinach and makes us sad. Don’t go on Sundays, people) as well as other food retailers in your salad-hood. Great healthy ideas! 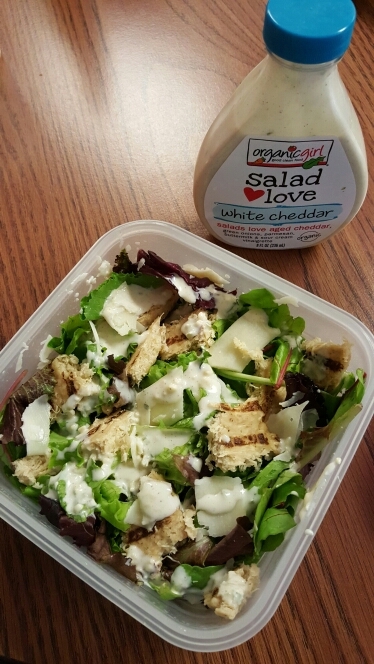 I always love seeing new recipes I can take for a healthy lunch option!